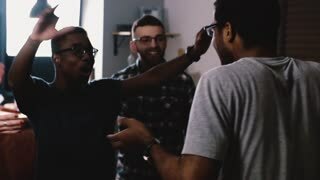 Group of friends at a Christmas party chatting in slow motion. 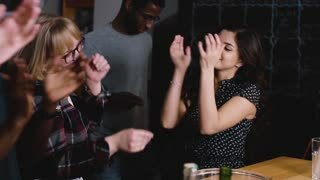 Multi ethnic millennials dance at a house party. Slow motion. Young people get wild and crazy on holiday celebration. Happy young people dance at party with confetti. Slow motion close-up. Multi-ethnic group joyful celebration. Emotion. Attractive happy Hispanic girl dancing at a party. Slow motion close up. Multi ethnic birthday celebration. Emotion. 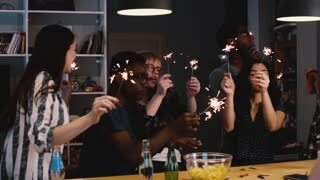 Happy millennials dance at a multi-ethnic party. Slow motion close up. Young people celebrate, get crazy emotional. Attractive girl dancing together with her friends. Slow motion close up. Multi ethnic birthday house party celebration. Multi ethnic college students dance at a party. Slow motion. Happiness, fun and joy. Holiday celebration. Emotion.